Bus drivers are the first safety factor – professionals who know their trade. In addition to a ‘normal’ driver’s license, bus drivers have a passenger transport license. In order to renew this licence every five years, a health and an eye test are required. Bus drivers over the age of 50 must also undergo tests on navigational skills, reaction speed, concentration, and the ability to cope with stress. All drivers are banned from drinking alcohol. Additionally, our bus drivers regularly attend courses and seminars to further their knowledge on relevant driving, technical, and safety issues. Technological advances serve the people, and excellent safety records underline this statement. Coach manufacturers are aware of their responsibility and work hard to get the latest safety engineering ready for production at economically feasible rates. In recent years the rigidity of the passenger compartment has been improved, leading to increased stability during rollover incidents. Incidentally, the German coach fleet is the youngest and most modern in Europe. Many electronic safety components have been added in recent times that are now considered standard features. These safety components improve the breaking behaviour and assist the driver in his monitoring duties among other things, so that full attention can be devoted to the road. Almost all coach accidents occur at night between midnight and 6am. The reason: fatigue and lapses in concentration. This is human nature and often difficult to prevent. Very, very few drivers can switch between daytime and nighttime circadian cycles without facing difficulties. The reason: School trips and bus journeys often depart in the evenings and arrive at their destinations at some point throughout the following day. For a 5-day trip, therefore, one could expect the journey there and back to last between 25 and 50 hours. The aim: to forgo nighttime travel. Passengers also win in terms of safety. Buses are only involved in 1.2% of all traffic accidents. Statistically, for every 5 billion kilometres travelled by bus, only one passenger will be involved in a fatal accident. Furthermore – and in terms of kilometres travelled – the rate bus-related accidents in Germany has almost halved since 1970. Since 2000 alone, the number of fatal accidents involving buses has decreased by over two thirds. The excellent safety record achieved by busses proves that technology serves the people. Bus manufacturers are aware of this responsibility and constantly invest in research and development, in order to provide the latest in safety technology as swiftly as possible. 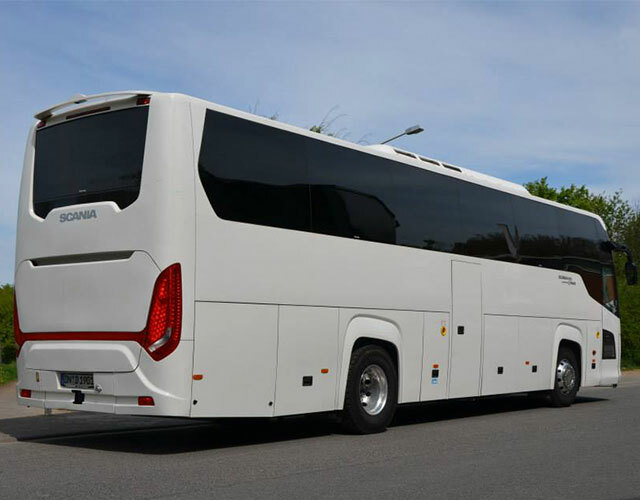 Since 2004, bus manufacturers that are a part of the German Association of the Automotive Industry (VDA), have been providing new coaches with ESC vehicle dynamics. The current R&D goals mainly target innovative means of accident prevention such as Lane Keeping Assist, Lane Change Assist, adaptive cruise control, and night vision devices. These are gradually being built into buses and coaches, and will prove a positive influence on the future bus safety. These systems improve factors such as driving performance and they support drivers in their monitoring duties, so that full attention can be devoted to the road. Contrary to automobiles, buses in Germany require an annual check-up. After the registration date, they must undergo an annual safety inspection in the second and third years. From the fourth year onwards, these safety checks happen quarterly. Subsequently, no other country in Europe maintains such a high standard of road safety. Bus safety also has a human component – the driver. Legislation demands extremely high standards from the bus driving profession. Drivers require a passenger transport license and are health-checked for aptitude. Every five years when licences require renewing, drivers must undergo mandatory health-checks and eye-tests. Bus drivers over 50 must also undergo examinations on reaction speed, navigational skills, concentration, and the ability to cope with stress. All drivers are banned from consuming alcohol. Bus drivers also regularly attend educational programs, seminars, and safety training courses. This excellent safety record is supported by intense governmentally conducted inspections for busses, drivers and companies alike, so as to ensure that the bus remains the safest form of transport. … that buses carry about 5 billion passengers every year? … that over 76,000 buses are being used all over Germany? … that on average, the way from home to the nearest bus stop is only a six minute walk away and the nearest train station is an average 27 minutes away? … that buses in tourist traffic have an occupancy rate of nearly 100%? … that a fully occupied modern coach can transport a passenger a distance of 100 kilometres using only ½ litre of diesel? … that buses emit less CO2 p.p. per kilometre than any other mode of transport and are only involved in about 1.2% of all traffic accidents? … that the number of fatal casualties caused by buses has decreased by nearly half since 2000? It now stands at 27%. … that buses have to undergo technical inspections up to four times a year? 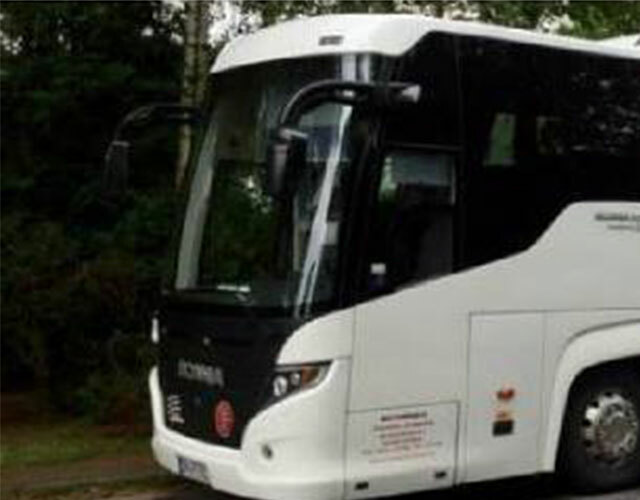 … that the German coach fleet is the youngest in Europe with an average age of 6.3? … that buses on motorways have a road coverage cost of over 300%?